If you are here reading this review, we bet you want the best quality steak knife set for your kitchen cutlery. For your information, we will help you make right decision. A well-built knife set is both durable and great in looks. 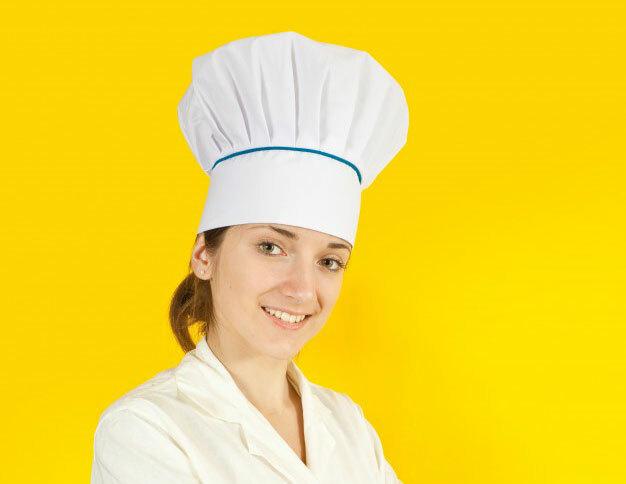 In addition, they are very versatile to cut different items and serve and prep savory meals. To make your dining table look more lavish, we are going to review the best steak knife sets. Like any quality knife for your kitchen, steak knives should have great cutting edge, balance, and comfort grip. But you need to consider other features to make the right choice. Steak knife should have sturdy edge which won’t damage the surface where you cut the meat, especially when you use a plate instead of cutting board. Steak knife should also feel and look luxurious to spruce up your kitchen space. Here’s what to look for when buying steak knife set. 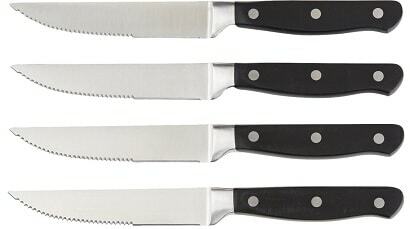 Serrated Steak Knives – These types of knives can make ragged bites of meat instead of straight-edge ones. It is very vital to get the accurate cut. Strait–edge Knives – These types of knives leave well-cut, buttery smooth steaks. But they still need sharpening after cutting every dozen of steaks. Hollow-edge knives – These knives have notch measured along the edges. These indentations make the air pocket to keep the meet from sticking and it also helps create finer slices. Micro–serrated edges – Many people confuse between serrated and micro-serrated knives but they are totally different. Instead, they share many things in common with strait-edge ones. They have tiny serrations which may wear out too soon. High carbon steel and stainless steel are two materials used in steak knives but you may also go with ceramic steak knives. The best part of stainless steel and ceramic steak knives is that they won’t rust easily. On the other side, you need to care for high carbon steel a lot. You need to choose between stainless steel and ceramic knives as per your preference. You can find steak knives come with handles in different colors and materials. Handles can be made of wood, plastic, or stainless steel. The different materials and shapes of knife handles will have varied feel and weight. So, consider researching some reviews before buying. The feel of the knife plays a vital role in its performance. It varies from user to user. It also determines the maintenance and washing instructions. It is another feature which is often overlooked. Top rated and long-lasting knives are made to ensure good fit. All the parts of these knives are tight to avoid any gap between the blades and handle. It plays a vital role in rigidity and strength of knife and it also prevents fluids, moisture and contaminants from getting into handle and affecting the shelf life of knife. Well, it’s not the first feature strikes into mind. Good balance is more important than sharpness and it can widely determine the performance of knife. Knife should feel comfortable to hold and handle should be placed well with the blade to ensure good balance. You can easily find steak knives under $20 or less. But you should read reviews properly to meet your design and cutting needs. Don’t compromise with quality of blades to save money. Choose steak knives with best reviews and results. You may choose knives from $25 to $50 of range which look really modern. 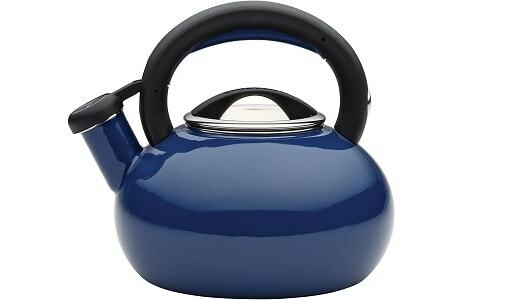 The handles are also very elegant and color options vary much likely than budget range. These knife sets are available with display blocks or storage boxes. For even better blade quality, you may have to pay around $50 as they also include warranty. Be sure to pick enough knives according to your needs. Usually, a knife set includes up to 4 to 8 knives. Some sets also include more knives. Consider warranty because some sets have limited warranty while some don’t have warranty. Now that we have listed all the above factors to consider before buying steak knife sets. Let’s review some of the best steak knife sets and their key features. This steak knife set from DALSTRONG is known for unmatched artisan ship. In addition, it is designed with unique technology and great design elements. These knives are engineered with perfection and made of high carbon steel for straight and sharp cuts. Its award-winning design adds to the modern touch to the kitchen décor. The lavish Packwood black handles in these knives are riveted for great comfort, durability, and maneuverability. 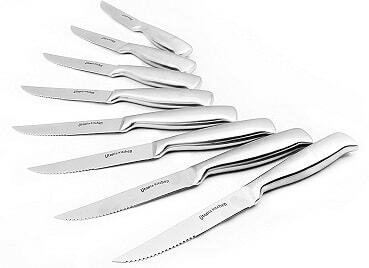 AmazonBasics Premium 8-Piece Steak Knife set is such a great bang for your bucks as it includes very sharp knives which work for different purposes. The sharp edge and single-piece built ensures great durability and performance thanks to triple-riveted handles as well as well-tang design for proper fit and balance. AmazonBasics is such a leading brand loved by the customers for quality products at affordable price. This 8-piece knife set costs just a part of the price of high-end sets. But it has micro-serrated edge which is likely to wear down easily and lose sharpening. However, it is no denying the fact that AmazonBasics’ knives are blazing sharp. Another major turn-off is that they should be washed by hand. With that in mind, it is sure that these knives are made for casual users who don’t use knives that much. These stainless steel steak knives come with lifetime warranty and they are marketed to be dishwasher safe. It ensures longevity with high carbon stainless steel but there is a doubt on durability due to its micro-serrated edges. J.A. Henckels is one of the most reputed brands for kitchen utensils and cookware across the world. Users are very satisfied with knife sets from this brand. Even though it is marketed as dishwasher safe by the manufacturer, hand washing is still recommended. After several washes in dishwasher, there are some complaints that the handles are affected very much. The lifetime warranty works only when some kind of breakage happens. Anything happens due to daily wear and tear won’t fall under warranty. 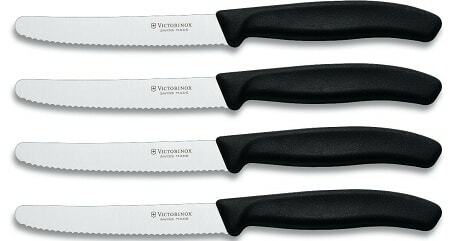 Swiss Classic 6-piece Steak Knife Set from Victorinox has been loved by professional chefs for ages. Now finally it made entry in domestic market. This Swiss Classic knife set has more ergonomic, modern looking handle with commercial-grade sharp blade. The whole set is made to comply with highest sanitary standards and it has been approved by the National Sanitary Foundation (NSF). This Swiss Army cutlery knife set has high-carbon stainless steel blades coupled with mirrored polish finish. These stainless steel knives are designed with great sharpness and hand-crafted with perfection in Switzerland. The handle is totally slip-resistant. Hence, it is dishwasher safe and totally hygienic. It has got positive reviews and is praised by a top magazine. This 8-piece steak knife set has been designed well by Utopia Kitchen using top quality premium stainless steel. Each of these knives adds premium feel and quality performance to add a sleek look to your table on meal times. 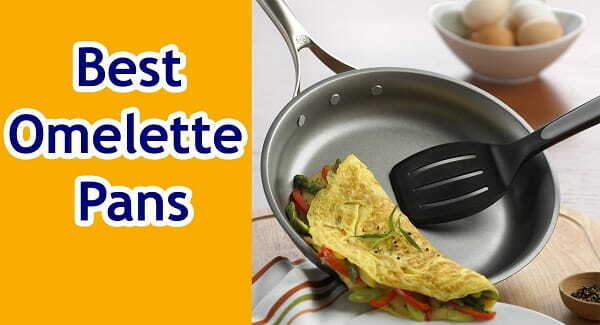 These quality knives are designed for smooth slicing and cutting on several food items. These steak knives are designed with care from one-piece stainless steel. Handles give balanced feel with robust stainless steel for more precise and smooth handling in cutting. 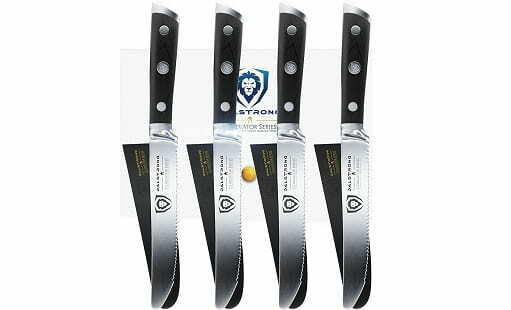 These knives have serrated edges which provide leaner slicing and cutting and great durability. You also won’t have to worry about sharpening. Whether eating at home or hosting a party, these knives are your best companion to cook great meal. It is best for cutting steaks. These stainless steel knives are both functional and beautiful. This 8-piece stainless steel knife set is perfect for preparing delicious dinner of grilled lamb chops or tender steak. These modern knives have serrated 4.5” blades made of 18/10 high carbon stainless steel for precision slicing and strength. The full tangs of the knives are made of sleek stainless-steel 18/10 handles to ensure great balance. 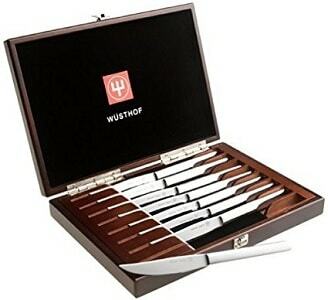 These knives are the best gift for your chef friend as it comes in velvet-lined wooden gift box that is decorated well with luxurious mahogany stain. 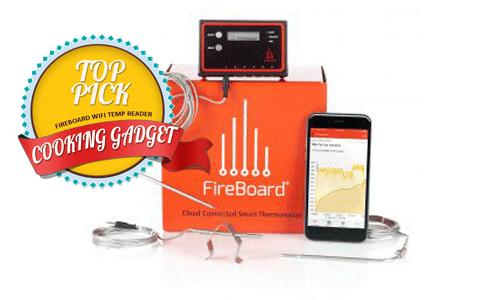 It is a great wedding gift as it comes with lifetime warranty. How to Use and Take Care of a Steak Knife? A steak knife is used to cut through the steak while you are dining. It is quite important to know how to use a steak knife as it is a part of proper etiquettes. It may look rude to other diners if you are not able to use the steak knife properly. Here is a quick guide for using a steak knife and taking care of the steak knife. To use your steak knife, hold the steak knife with the handle using your dominant hand. Use your index finger to support the knife by placing it on the dull side of the knife. Now, grab a fork with other hand and hold the food on the plate with the fork. 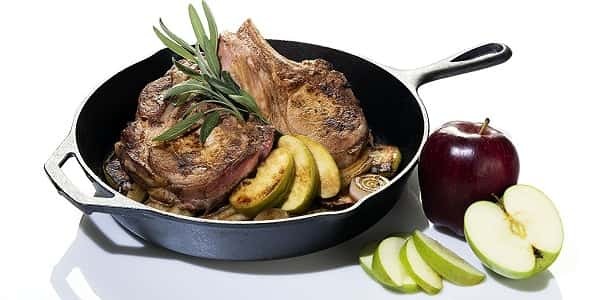 Now, simply cut through the steak and depending on the sharpness of the knife and the tenderness of the steak, you will be able to cut through the steak. Once you are done, you can place the knife back on the plate and you can switch your fork to the dominant hand to continue eating the steak. You must avoid keeping the steak knife on the tablecloth as it can create a lot of mess and it can leave the tablecloth quite dirty. You may use a quarter plate to keep the knife. The steak knife should always be hand washed. Avoid using a dishwasher to clean the steak knife. Do not let the knife sit on a wet surface for a long time as the knife can get rusty. So, as soon as you finish cleaning the knife, you can simply dry the knife and store it properly. During the storage, avoid keeping the knives directly in the drawer and try to use a knife block or a fabric to protect the knife. This way, your knife will last longer. This is how you can use the knife and take care of your steak knife. This will help you in ensuring that you do not have to change the knife frequently. Along with cutting meat, best quality steak knives are designed to give stylish and contemporary look to your kitchen. Any of the knife set listed above can add elegance and great feel to your next dinner party so you can serve steak in a great way. Consider the features of each model and choose the one according to your needs. All of these knives are known for being durable and strong. We hope our steak knife review will help you make the right decision.